Reflecting on Pentecostal roots and obnoxious witnessing. When Grant Wacker’s Heaven Below was first published, I read it and had hoped to write a review of the book. Although this really is not a review of Wacker’s book, reading it did bring some things to my mind. Wacker had unquestionably researched our roots more deeply than any other author with whom I am familiar. His pages were filled with fascinating detail and presented our forefathers in this genre of Christendom with great understanding and yet, I found myself troubled with his writing as I began to realize that I was defending the people he was writing about. I needed to protect them from what I perceived were Wacker’s critical comments. You see, I love these spiritual ancestors of mine even though not one of them is an actual ancestor. I know that they stood for God and his enduing power in a period when the world and even many in the church looked down on these woebegone fools. They believed they had received the promise of the Father and began to move out into this arena that did not want them at all. Somewhere in Scripture it says, Not many high-born, not many wise. Likewise, the Pentecostal pioneers were not exactly the leading element of society. Seymour was a one eyed black waiter turned preacher who lived with a black bank janitor and held a small group meeting at a black railroad worker’s home. While white, Parham was a ne’er do well preacher that added to the folly of the unfinished Topeka, Kansas mansion called Stone’s Folly. Agnes Ozman was a strange girl that somehow got caught up with those weirdos. These people did not have churches, education, qualification; they were the bottom rung; the folks who did not and could not count. They had no manners or breeding, no social standing; they lived on the wrong side of the tracks or in places where they were too poor and too useless to have tracks. Promise of the Father? Get real. Now my zeal and love for these downtrodden, unappreciated ancestors is easy to maintain. Since they are all dead, I can easily fantasize wonderful lives and great Godliness for all of them. I thought about Wacker and his book the other night when I visited another Pentecostal church during its Sunday evening service. What got me thinking was how I had to suffer through some rude woman right behind me babbling on and on in tongues. She was being far too loud for my comfort and I thought she would never shut up. That rude woman made me remember my denomination’s annual convention last spring where we had to physically tap the shoulder of another woman who refused all attempts to stop babbling and moaning on and on in tongues while the speaker was attempting to lead the congregation of several thousand Pentecostal preachers into a deeper moment with our God. Even after being touched or tapped (at that point I was ready to rap, not tap) she persisted in making noise though she finally gave in and was silent at last. I was starting to wonder if this was like the silence in Heaven mentioned in Revelation. Please do not take me wrong. I am not against tongues. To the contrary, I have had this gift in my life for 39 years; I can and often will interpret for others who speak in tongues, and I frequently have a prophetic word which I have shared when appropriate and for many years only with the permission of the leader of the meeting. I am against people who are rude and interrupt the flow and movement of the Spirit by drawing attention to their giftedness when no one cares to begin with and cares far less after. 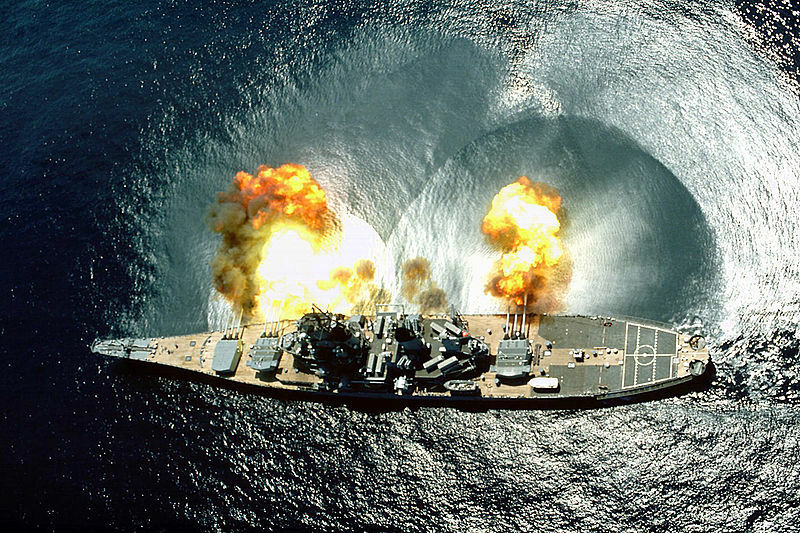 Battleship USS Iowa giving a full broadside. When I visited my mom back then, I always put a little pocket Bible in my front shirt pocket. I knew that its presence there upset her, and part of me liked to upset her. Perhaps as a consequence of my rudeness, I never got to pray with my mother or father, we never were able to share a word from scripture nor did my father ever go to any church service or related event with me except his funeral and that was at a mortuary. My mother went once and heard a concert of Gospel music which led her to wondering on the way home how much money the singers were paid. I did not do well with my mom and dad or anyone else in the family. Forty years and more now have passed and I am still the only believer in my house. One of my five children is a Christian and she was 36 when that happened. As I have grown older, I have learned to be far more sensitive and sensible in my witnessing. I don’t want to be in anyone’s face; no, I want to be in their heart along with my Lord, and the way to get there is not through their face but through the servant’s entrance, a route with direct access and within easy distance of the throne. How about you? Do you like to shock others with your Pentecostal gifts? Do you break out in tongues when folks like the Apostle Paul and Pastor Mur (me) and the rest of the audience want to reach over and tap you on the shoulder and say: “shhh, be quiet.” Do you draw attention to yourself or are you content to wait on the One to Whom we owe all? I am afraid that there is some justification for the historians of our movement to look at us with just a hint of scorn and bemusement. The power from on High that has enabled us to reach so many no doubt was and is intended to help us reach far more than we have so far. We learn everyday, but those who are truly the best students only need one lesson. I want to be the best student there is in the Kingdom of God; how about you? 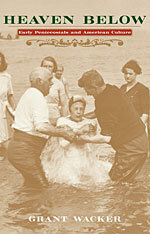 Note from the editor: Grant Wacker’s Heaven Below: Early Pentecostals and American Culture was published in early 2003 and this guest review by Murray Hohns was originally published in early 2004 at the Pneuma Foundation website (the Pneuma Foundation is the parent organization of PneumaReview.com).